A Friday morning recce of Snettisham Beach was carried out by Cathy who arrived earlier on Thursday. 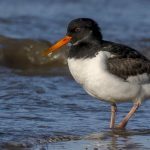 Approximately 1,000 each of Knot and Oystercatcher were seen roosting on the beach at high tide. The rest of the team arrived Friday afternoon to discuss plans for the weekend. The weather forecast, with moderate to strong onshore winds, was unsuitable for cannon netting on Saturday so no nets were set. The team met at the base house on Friday evening for a meal and to discuss plans for the weekend. Cathy had been at the base since Tuesday and had undertaken several trips to the coast to determine available opportunities for re-sighting and had already obtained some resightings. Cathy had recced the favourite fields around Heacham but had not found any Curlew, possibly as it is too early in the winter for the Curlew to use the fields as yet. The majority of the team assembled Friday evening to prepare for the week ahead. Introductions were made and included a warm welcome to Clive who was one of the founding members of WWRG in 1959 and was looking forward to revisiting old haunts. Early recces from Cathy yielded little more than c. 40 Sanderling on Snettisham Beach so the plan was agreed to mist net on Saturday morning at Gedney. An early start to the trip for Rob, Cathy and Kathryn as they recced on Saturday morning and reported lots of Sanderling (1,000+) on Snettisham and Oystercatchers on Heacham beaches, with Curlew in fields inland from Heacham (Island camping club, 14 seen, three of which were flagged, with two readable). A Sanderling catch was planned for Sunday morning which would be set just after high tide on Saturday evening. A 17:30 meal gave time for additional recces prior to a 19:45 setting. Lucy gave the first team talk of the trip at 18:00 then the team headed out. Four nets were efficiently set before the rain started and the team were back at the base house by 22:00 for a pre-catch briefing. The trip started early for Cathy and Tim who met the plumber who had come on Wednesday to improve the flushing rate of loos – it seems to have worked well. Cathy then took the opportunity to do the shopping for the weekend and started cleaning on Thursday, with more cleaning on Friday (it now looks like we have a new oven). It won't be long before they head up to the Arctic to breed. Photos credits (where not stated): Ruth Walker, Rob Robinson or Cathy Ryden. Copyright © 2017 Wash Wader Ringing Group All Rights Reserved.